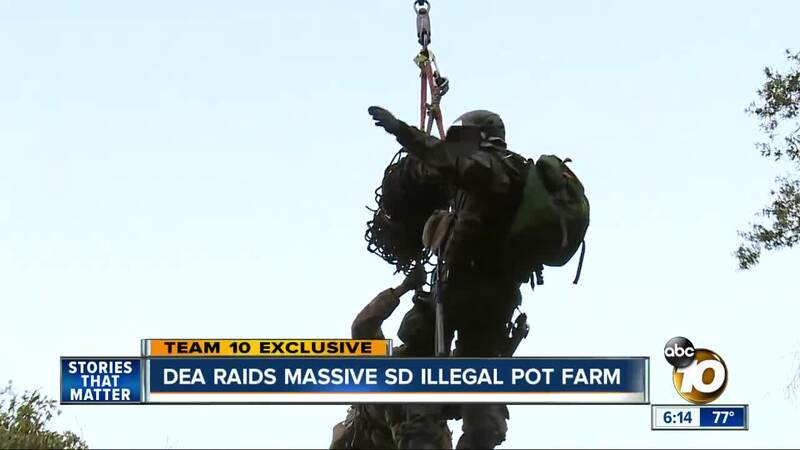 SAN DIEGO (KGTV) -- San Diego local and federal law enforcement keeps finding huge, hidden pot farms being grown illegally on public lands. 10News Investigative Reporter Jennifer Kastner and Photojournalist Dave Pickering came to an undisclosed spot on Palomar Mountain for exclusive access to a high-risk operation, led by the Drug Enforcement Administration. Agents and officers say Mexican cartels are responsible for most of these remote grows. 10News began the raid operation at sunrise. We’ve blurred most of the faces of the officers and agents involved with the task force, for their safety. They include personnel from various local and federal agencies. The terrain is steep, rocky and filled with poison oak. We followed a second team down into the grow. It was too dangerous for us to hike in with the first team tasked with making initial contact with any suspects found at the grow. Suddenly the agents and officers surrounding us started running after we heard that the first team made contact with a suspect at the grow. We arrived on scene to see more than 3,200 tall, healthy marijuana plants. Next to them, we saw a man in handcuffs. Law enforcement arrested Rafael Perez, a Mexican-national who had since pleaded guilty to having a firearm when he wasn’t supposed to, according to the DEA and DA’s Office. He was reportedly sleeping in a tent at the grow, when law enforcement moved in. He explained his criminal history to law enforcement, telling them he was in prison for lots of DUIs. They ask Perez if he was flown in, but he says he walked in. They ask him that because sometimes cartels will fly their grow tenders into grows, to drop them in isolated spots like the one we were in. The grow is set up like a campsite. There’s a makeshift shower and kitchen and a tent with sleeping bags. The grow we found was a highly sophisticated one, with a drip irrigation system and strong chemicals that are banned. Agents show us various fertilizers and pesticides discovered on the grow that are hugely harmful to the environment. “I mean you look around and you can see they're destroying the ecosystem in this area,” says Hedquist. After illegal grows are discovered, law enforcement typically spends hours cutting down the plants and then air-lifting them to a secret location to be burned. The plants at this grow are valued at up to $5.5 million. Perez is scheduled to be sentenced next week. He faces a maximum possible sentence of five years and four months in prison.